PLEASE ALLOW 2 WEEKS FOR THIS ITEM TO BE DELIVERED! 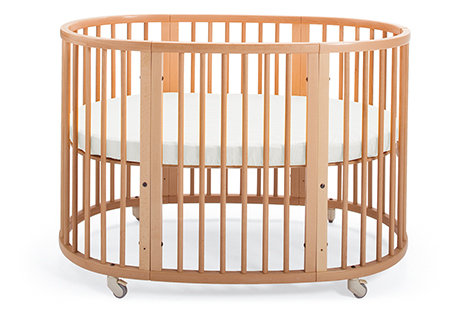 Stokke® Sleepi is an evolving bed that grows with your child from 0 to approx. 3 years and with the additional Junior Extension Kit up to approx. 10 years. It expands to accommodate the changing needs – and sizes – of the growing child, while maintaining a comforting familiarity with its distinctive oval shape. Once your baby reaches the curious climbing stage, you can remove one side of the bed for easy access, and to boost feelings of freedom and independence. PLEASE NOTE: DRAPE AND DRAPE ROD NOT INCLUDED!